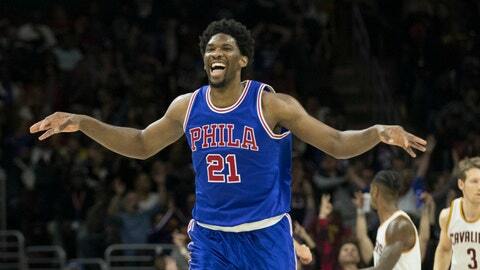 Joel Embiid has a lot of mythology about him for a 22-year-old, which isn't surprising. After all, his journey to the NBA from his home in Cameroon is in many ways a Hallmark movie-level American success tale—one punctuated with hilarious and clumsy cultural fumbling on both ends. One of the most well-known stories of Embiid's transition to America is the one about about him killing an African lion at the age of six to prove his manhood—a story Embiid now admits he might have fabricated to mess with wide-eyed Americans asking about his upbringing. Embiid also spoke about his feelings on Donald Trump winning the election, and his view of his America since coming to the United States and experiencing it for himself. Embiid's words follow up one of his all-time tweets—a one-liner from election night. It's hard and flawed, but democracy is, indeed, a process. Dan is on Twitter, trusting the porpoise.